How to Properly Care for Flowering Trees in Winter | Mr. Tree, Inc.
Is Wood Chip Mulch an Effective Option? As any homeowner will tell you, your first winter in your new home will have its quirks. The cold weather affects everything; from the draft that blows through your windows to the pipes that bring water to the facet. If you don’t plan well, the cold weather can certainly make you miserable. Which is why you’ll want to make sure that you’re as prepared as possible, and that goes for what’s outside your home as well. Many people forget to plan for their lawn and foliage care before the winter months come, but this year don’t let that be you. How you care for your plant is just as important as the preventative steps you’ll take to stop a frozen pipe before it happens and a small, simple adjustment can make a large impact. Take it from us, if you start planning your winter lawn care early, you will be well prepared for whatever winter may bring. For most people, it is imperative that they spend time planning for how they will care for their flowering trees. When we think of flowering trees what comes to mind might be trees that bloom in spring but lose their flowers and become barren from December to March. But there certainly are trees that can both bloom and produce fruit once the weather starts to drop. In fact, many home gardeners plant ones that bloom in the spring, summer, and fall so that they will have year-round flowers in their gardens. There are also blooming trees that will start setting new buds as soon as the old flowers have fallen, a process that can happen all year long. 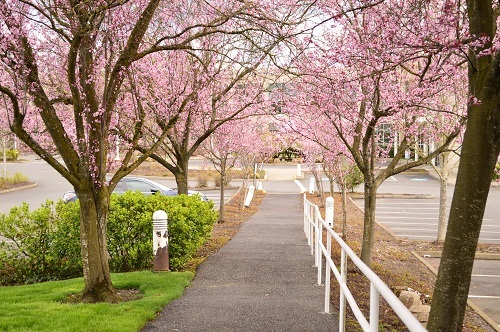 These trees require a little bit more maintenance, and while Mother Nature can do much of the work to keep blooming trees healthy, any tree care professional will tell you that blooming trees will benefit greatly from pruning. Pruning is the process of trimming dead tree branches or debris that can inhibit tree growth using a pruning shear or handsaw. In the winter, trees can be pruned even when dormant and, in fact, it is to the betterment of your trees that you prune in winter so that by spring they will be cleared for new growth. Why winter? Though it might seem like spring is the right time to prune, in reality, the warm weather and sunshine can actually be worse for your trees. Pruning is a stressful process on plants and when you prune flowers and branches off a tree at their peak season it puts more stress on trees than necessary. Additionally, pruning while a tree is actively trying to sprout new blooms can inhibit the growth of your flowers. In the end, it is best that you wait until winter before you pull out your shears. Without the burden of making sure that your tree isn’t flowering or sprouting new buds, it is much easier to prune the tree without impacting your tree’s health. Pruning in the winter also means that there is less chance for infestation from pests or infection from disease. Pruning naturally creates open wounds in trees and though a tree can heal itself, the process may take several days and leave it vulnerable to the elements. In the fall and spring, this is especially true as that is when fungi spread their spores with more frequency. Therefore it is much better to wait until the cold months when pests, bacteria, and fungal spores are inactive and your tree won’t have to fight out infection as well as heal itself. If you have trees that will eventually grow fruit, pruning is even more important. Pruning can help maintain the structural integrity of your tree and make it strong enough to grow the fruit. Pruning may also make your trees look more attractive and that is a benefit to any home gardener who wants to show off their landscaping in the warmer months. Additionally, some of your flowering trees, including maple, walnut, and birch trees, may “bleed” or leak sap during this process. But that is normal and won’t harm the tree. Just make sure to prune while the weather is still cold, but perhaps not during the coldest months (January to March). Pruning should be considered a typical part of your tree care routine and the dangers of not pruning will be revealed come spring. A tree that has been left untreated will have less flower growth, be more susceptible to disease, and can become distorted or weighed down. Your tree will be at its healthiest when it has been carefully pruned and manicured. If you’re nervous about pruning your tree for the first time, why not hire a professional tree care service to do the job for you? At Mr. Tree, we are the best Portland, OR area tree care experts and know exactly how to or when you should prune your flowering trees. We offer it as one of our residential services. We also have expertise in tree shaping, trimming, stump grinding, and tree removal — perfect no matter what your specific tree needs are. Pruning isn’t just beneficial to your flowering trees, it can be helpful for large trees that have dangerous branches, can clear away branches that are making your tree too top heavy, balance uneven trees with branches that grow more heavily on one side, and may help clear trees away from entryways or other areas of your home where they might cause an issue. It is always best to go to knowledgeable specialists with a long reputation for customer service and care behind them. At Mr. Tree, we are those specialists, and we take pride in the fact that the Portland area can call on us for all of their tree care needs. So while the weather is still chilly, why not give us a call and allow us to give you a hand?